1. Drinking hot things without feeling like you are going to burst into flames. This is a big one for me because as a lover of all things containing caffeine. 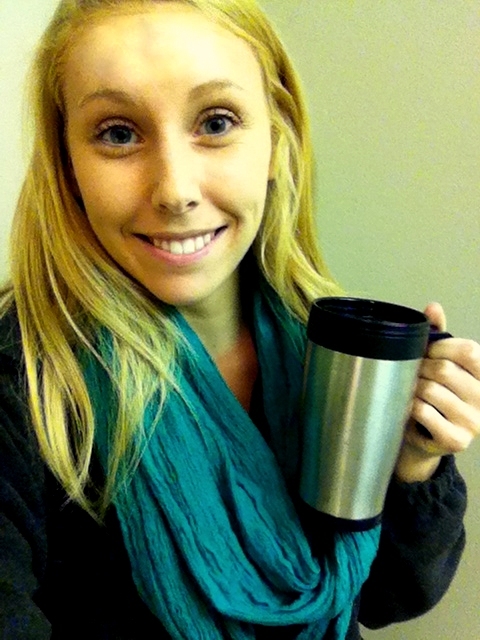 I have a hard time trying to drink a coffee on my way to class when it is breaking into the 90s. It’s far from my ideal of sipping on a cup of steaming coffee or hot chocolate while bundled up in all sorts of winter gear. 2. I actually know how to dress for this weather! 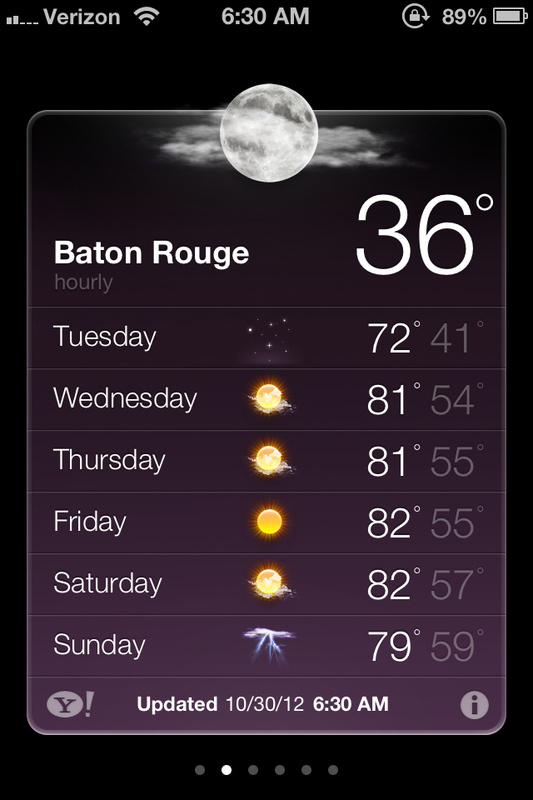 When I first got to LSU, I found that it was hotter than the surface of the sun. I had never experience this kind of heat or humidity and it was miserable. All of the clothes that I had brought from home were essentially useless and I quickly learned that the only way to survive the heat is shorts and a tank. Although I don’t necessarily get dressed up for class (I usually rock Nike shorts and a tank top), I like having the OPTION to do so. Take yesterday for example. 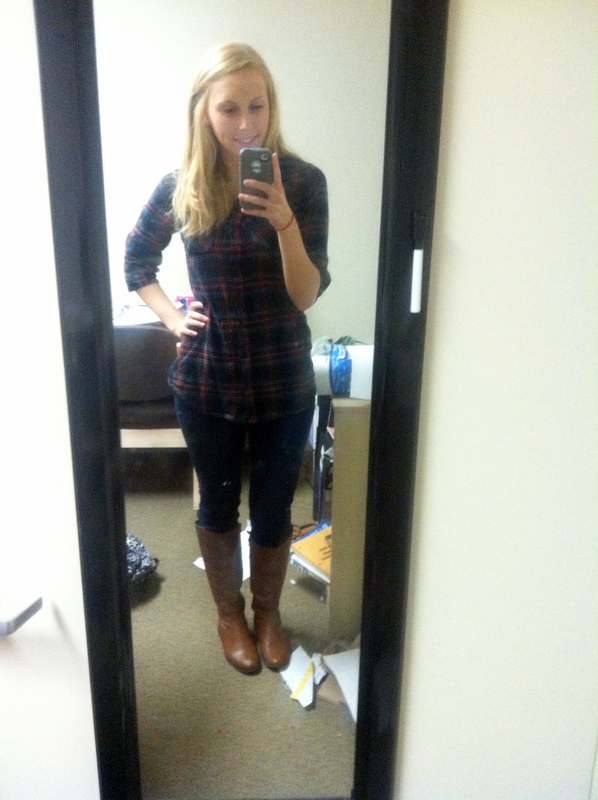 After pulling an all nighter to study for an Organic test, I was excited to throw on my (ahem) dusty riding boots, a pair of jeans and a flannel. It was like being back home. 3. It makes crawling under the covers before bed the best part of the day. There is nothing I love more than finally getting to go to sleep on chilly days and shaking the chill. I especially love throwing my comforter or pillows in the dryer for a few minutes before bed so that they are extra extra warm. The only downside to this one is waking up in the morning and talking yourself into getting out of bed which can be pretty challenging. Who knew it even got this cold in Louisiana?! As you can see, the weather is certainly going to be a little more reasonable this week but I’m not getting too comfortable. Before I know it, I’ll be back in Massachusetts hoping that spring and summer come earlier than expected! Hope you’re all having a wonderful Halloween and a great week! It is finally Thursday, or at least it will be when this post finally goes up. 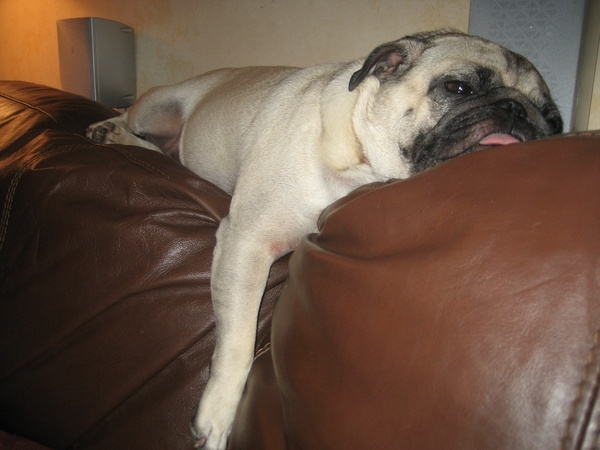 You’ve almost made it to yet another weekend so hang in there! I know that I am looking forward to relaxing and hopefully kicking what is left of this cold that just won’t seem to go away. It’s definitely been taking a lot out of me this week and it’s been killing me that I haven’t had a chance to work out. I have, however, had plenty of time to study. 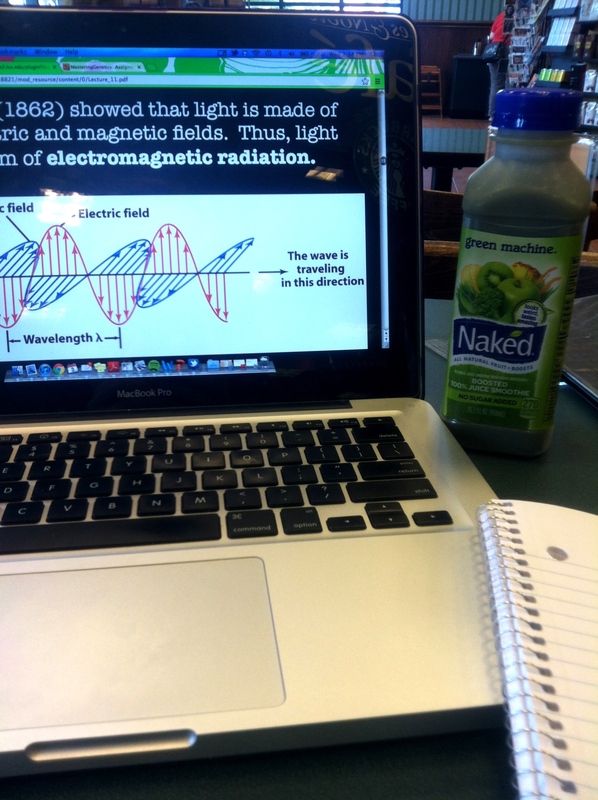 Yesterday, I spent a few hours at Barnes and Noble studying for my Astronomy and Organic tests next week with a yummy Naked Green Machine. It’s nice to finally study at a BN where everyone else looks just as nerdy as I do. Back home, I was usually one of the only people with all of my textbooks spread all over the big tables. I returned to my apartment and sat in our kitchen for a while before finally realizing that I was absolutely starving. I haven’t had much of an appetite the past few days with this cold so when I realized I did, I wasn’t even sure what to eat. I also realized that I haven’t been grocery shopping in ages so I was left rummaging through the cabinets to find something yummy. Fortunately, I found some mushrooms in the fridge and soy sauce in a package that my dad had sent me at the beginning of the school year. My dad always makes beef and broccoli with the sauce back home so I figured I could manage to make some stir fry mushrooms the same way. 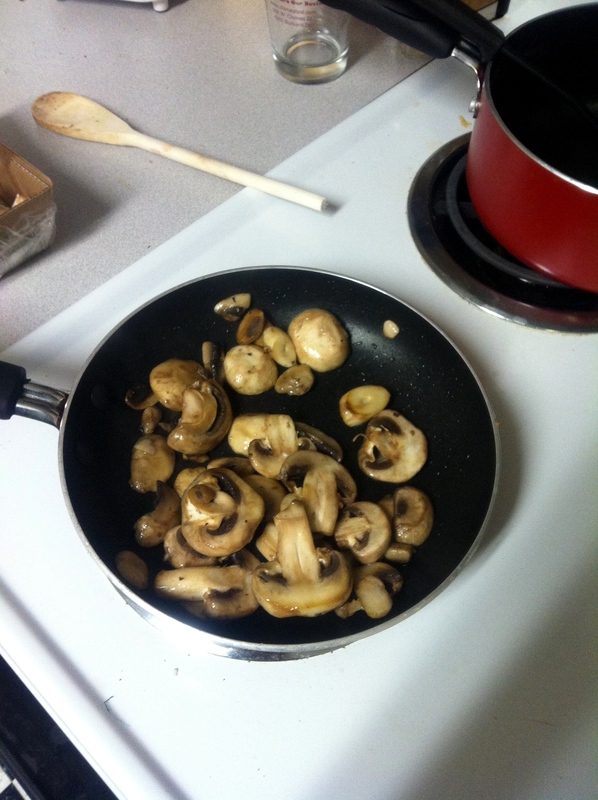 I threw about half the carton of mushrooms into a frying pan and added a bit of olive oil. I let the mushrooms sit in the oil for a bit while the browned, occasionally stirring them until they reached a texture that I liked. 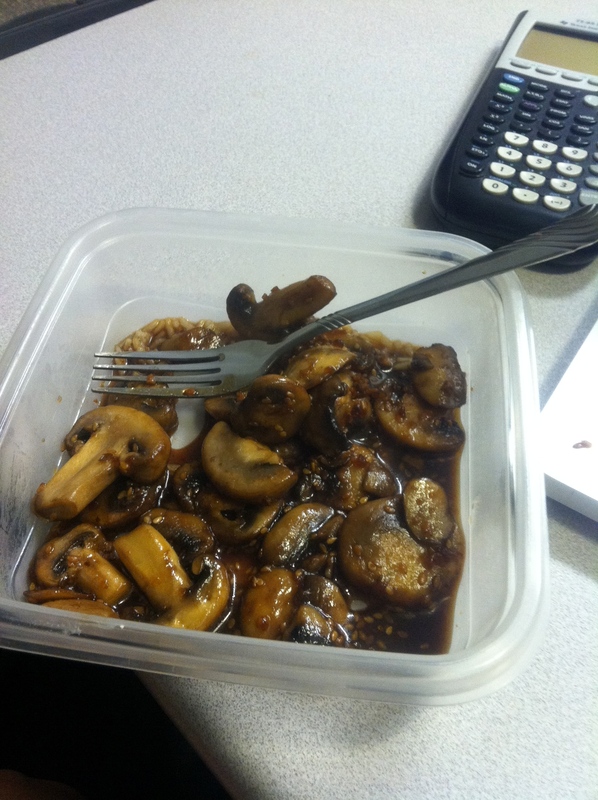 Then, I added a bit of the soy sauce and mixed it together with the mushrooms and voila! Dinner! I whipped up some white rice on the side and mixed it together after taking a yummy looking picture…. Well I am off to finish some more homework, watch the debate and eventually get a great night sleep! I hope you all have a wonderful Thursday and hang in there! It’s almost Friday! P.S. I updated the recipe and fashion pages! It’s Thursday and you know what that means! The weekend is just around the corner which means some much needed R and R for everyone I’m sure. I know that I can’t wait to kick back tomorrow night, pop in some flicks and just unwind from such a short but crazy week. 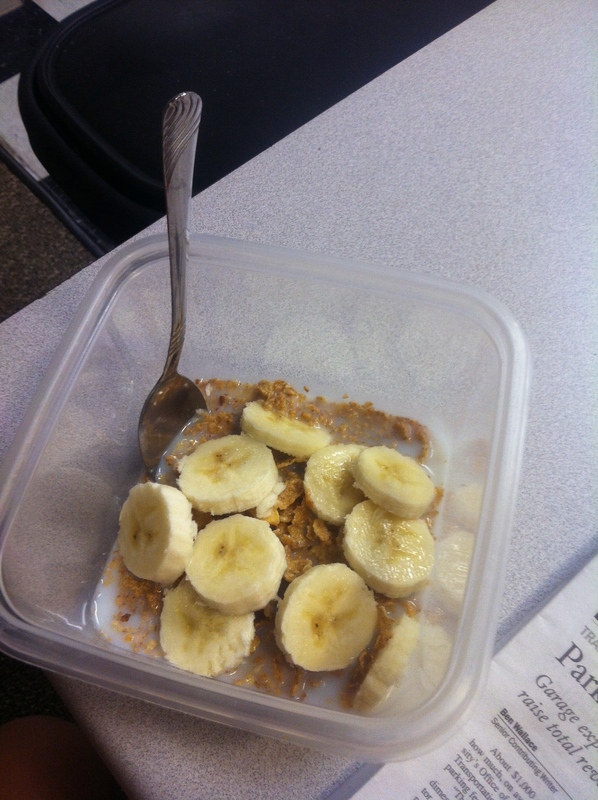 I snuck in a quick breakfast of half a banana with Special K and skim before setting of for the day. Today started off like any other with classes, specifically Organic and Calc 2 recitation. Apparently, the TA that I had last week for my recitation was in the wrong class and never realized it so I had a completely different person teaching today. Once classes were over, I was planning on hitting the lakes again for a run but, as is normal in Louisiana, it was hotter than the surface of the sun so I opted for the UREC instead which I knew would be pretty quiet at 11:30 AM. Some yummy and filling breakfast to start the day off right! My body will definitely not be too happy tomorrow but I do it all for the love of fit (see what I did there? 🙂 ) After leaving the UREC, I stopped in at the apartment to drop my stuff and then headed over to the Union where they apparently believe that air conditioning only works when it is set to 4°F. It was so chilly in there when I walked in after, not only leaving the gym, but walking outside where it feels like 100°. Definitely not the shock I was expecting. 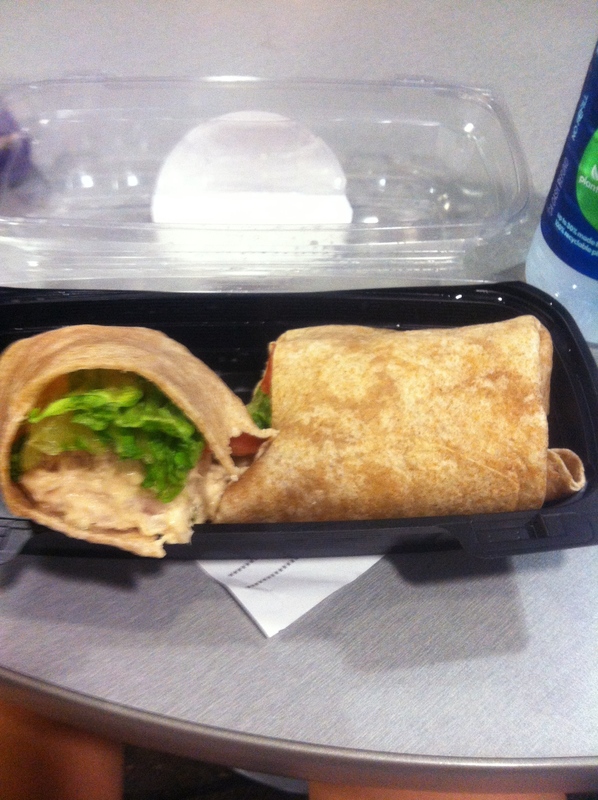 I ended up grabbing a tuna salad wrap from Einstein Bros which was far from spectacular but filled me up. Plus, fish has a lot of good protein so that was a good post-workout meal. As for the rest of my afternoon, it will be spent at the library working on some assignments and attempting to get ahead to that when this weekend comes around, I will be able to crash when the clock hits 12:30, I will, after hitting the lakes of course, be able to lounge around and hang out for the weekend, or at least until the football game comes along on Saturday night! This week, Washington State Huskies are going to be at Tiger Stadium for yet another crazy night of football. Hopefully we can up that record to 2-0 without any problems. As for the rest of the day, I hope you all have a wonderful afternoon and just keep in mind that you’re almost there!